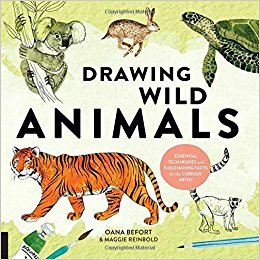 Drawing Wild Animals: Essential Techniques and Fascinating Facts for the Curious Artist is everything I love in a book! It truly is for the curious artist! The illustrations are simply gorgeous, the directions are clear and easy to follow, and the explanations and scientific background of the animals are fascinating. There are just so many beautiful pictures illustrating the techniques covered, this art book is eminently usable for artists of every age. I can’t think of any way to describe how I felt about this book after reading the PDF; I just wanted the physical book in my hand so I could admire the printed illustrations and share it with my daughter, who also loves to draw. The Flexi binding is very nice; I haven’t bought a book bound like this before. It really seems as if it will hold up; the signatures are saddle-stitched, and overall the book has a very nice feel with the covers being flexible yet sturdy. Overall, just a gorgeous book and a pleasure to page through and hold. Yes, I have a thing about books! To feed your curiosity, you’ll learn the characteristics, behaviors and, habitats of animals from categories like predators, grazers, and marsupials. To nurture the artist, you’ll get step-by-step instructions that show how to develop each animal from simple shapes into richly detailed drawings. Armed with a deeper understanding of animals, you’ll be better able to capture their stunning beauty and enchanting attributes in your artwork.